These 15 people participated in the classes, and have really enjoyed the process. First, cut lots of little squares. Keep them organized! 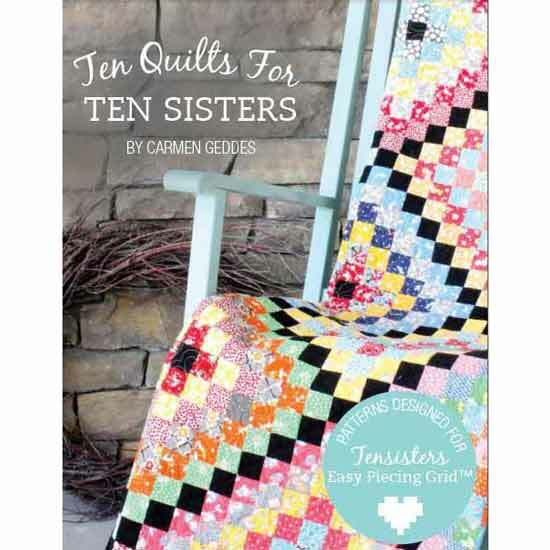 Next, place all the squares on the printed fusible interfacing grid available from Ten Sisters. 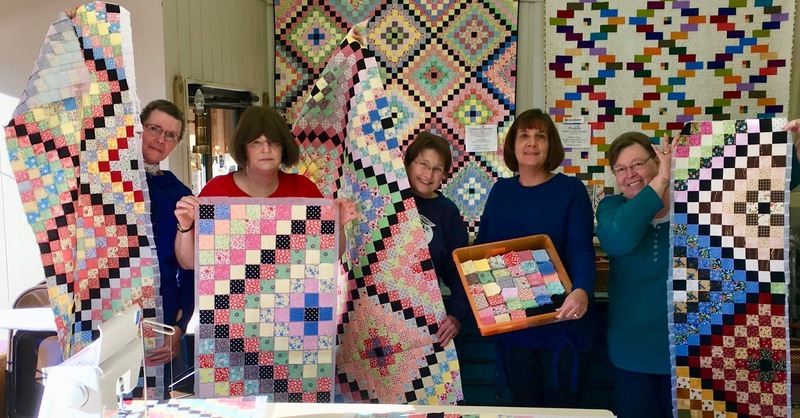 There are color layouts for quite a few different quilts. Use a hot iron to press and fuse all the squares into place. Sew all the seams! The grid is available for 3 different sizes of squares. 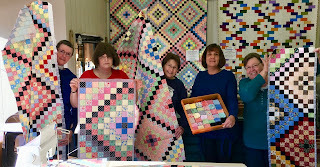 Most of these people used the medium size, which yields 1 1/2" squares when finished. There is a smaller size (1" finished) and a larger size (2" finished). Laurel started out the class groups with lots of helpful ideas and tips. Then she tried to do gymnastics on her stairs, and ended up in a world of hurt! She's on the road to recovery, but unable to work, sew, knit, teach and do most everything else fun! Anyway, I'm the lucky on who got to finish out the class sessions, and worked on a sample panel for myself so I would know a little bit more about what I was to teach. Always a good idea to know what you're talking about! Well, making up those mosaic panels is fun! And could easily become an obsession! Now I understand why I have seen a lot of squares being laid out on the grids on our tables during Open Sewing! It does take some patience to put all the squares in place, but I found it very enjoyable. I think it's something like the adult coloring book fad and the relaxation and zen that go with that. Just laying out little squares in a design that is carried throughout several panels to make the whole quilt. You might want to try it to help you calm down from all the holiday happenings! If you want some zen for yourself, just call us and we can package it up for you! We just finished our annual Customer Appreciation Sale and very successful food and toy drive, thanks to our generous and loyal customers! It was a fun 2-day sale with lots of happy shoppers! 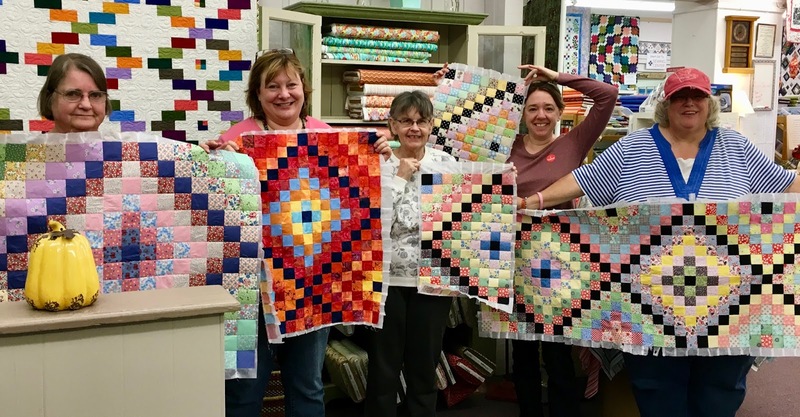 Would you be surprised to know that many quilters came on both days? Doing the preliminary shopping and reconnaisance on Day 1, then going home to make a list of what they really need to finish a project in progress and/or kick off something new! Day 2 finds them back at the store with a grip on their lists! We all had a good time, and it was a new and unusual experience for us in other ways-- both Debbie and Laurel could not be present due to some health problems, so the minions dug in and went to work! We pretty much pulled it off without a hitch, except for the power outage just a few minutes before closing on Friday. That really stops everything, including the few customers remaining in the store! Very hard to match fabrics by the light of your phone! The whole downtown area went black because of the wintry storm we were having at the time. When the power came back on later, attention was needed to make sure all the computers (which are our cash registers) were back up and running normally. And the Friday totals and daily deposit could be accounted for before we were back at it on Saturday morning. All in a day's work! Flipping back through the calendar and my pictures, one big thing that happened since I last posted was a trip to Houston for International Quilt Market. If you watch our Facebook page, we did post some albums of pictures there at the end of October. So pop over there for all that good stuff! Here's the overall picture of a wallhanging of circling dragonflies. Look below for a closeup of the quilting. 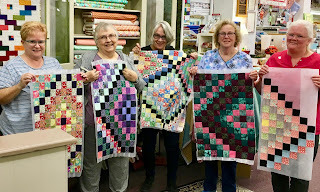 The straight line quilting in the widening hexagon shape makes a great backdrop for those dragonflies, and would be very do-able on a domestic machine. The wings in this dragonfly show very close quilting in matching thread colors. A pretty effect, and, again, very doable on most any machine. The lines don't even have to be consistently spaced for this to work. Just attach/engage that walking foot, and you can try this out for yourself. Here's a picture of Brigitte Heitland, the designer of Zen Chic for Moda. The arrows look like the route that Debbie and I walked all around that convention center! Below is another Zen Chic pattern, and very interesting quilting to fill in all that blank space surrounding the colored triangles. 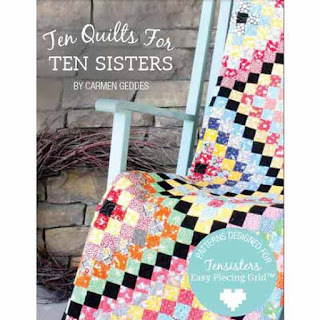 I liked that there were variations in the quilting design in that background, making me re-think my approach to the same sort of situation on my own quilts. And just for some variety, here's a cute little baby romper that just was irresistable to me. I'm a sucker for these! And, with my #3 grandson arriving in March, this is a must-do! 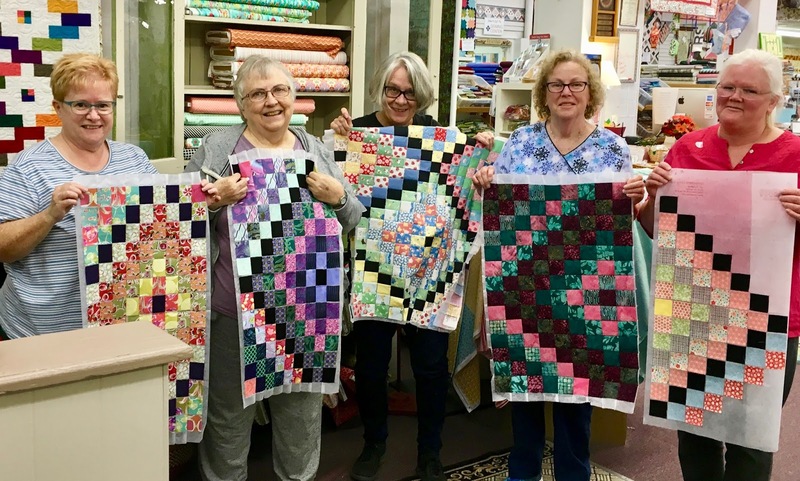 We are still receiving new items almost daily that were ordered during our days at Quilt Market, so there are a lot of great ideas popping up! Time for new samples!